Sometimes even when it comes to technology the best ways of doing things are the old fashioned ones. Take bulletin boards for example. Bulletin boards were and are great. You can easily see what’s going on, what other people are up to, communicate with people who aren’t around you, and remind people of stuff. They’re simple, they’re visual and they work. Bulletin boards have helped bring people together for a long time. I think that’s why, when it comes to project management we are such fans of Trello. It takes something classic and adapts it to the wonderful world of technology, creating a tool that is helping streamline modern businesses everywhere. Since the dawn of time, workflow and project management have been befuddling almost any group of people trying to accomplish anything. If you own a business or have been part of a business, you know what we are talking about. No matter how many meetings you have or plans you write up, someone will always be confused about who is responsible for what. Person A will blame person B, and Person C will say they couldn’t do their job because they were waiting on Person A. You’ll assign something to Person A, ask about it a few weeks later and they’ll say, “I didn’t realize that was a priority”. We know all about these issues. Until we started using Trello 8 months ago, we were plagued by them. Quite frankly, it’s just not acceptable. We have a strict “No Excuses” (Here’s a free book we wrote on how we manage) policy at Hubstaff, yet 9 months ago we had long email threads full of them. Today, excuses are still a part of doing business, but we’ve seen a complete 180 on the amount of excuses that are project management or workflow related. 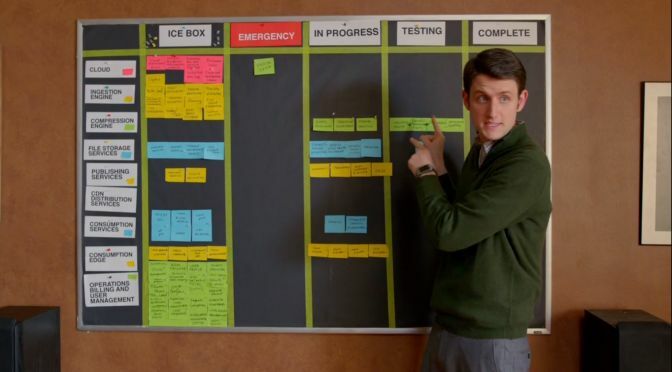 If we want to be specific, Trello really isn’t a bulletin board at all, it is a Kanban board (you may have seen this being labeled as “scrum” on HBO’s Silicon Valley). Kanban comes from the Japanese word meaning board and was popularized by Toyota (but stolen from the supermarket industry) as a way to improve the manufacturing process. It involves organizing projects by workflow. Generally, Kanban boards involve “to do”, “in progress” and “completed”. Today, the Kanban method has established itself as an effective and agile means of getting stuff done; whether it’s in manufacturing, software development or marketing. The Kanban system works because people process visual information 60,000 times faster than text! That’s probably where the Trello founders were coming from when they launched Trello at TechCrunch in 2011. Their goal was to create a product that would help solve age-old, high level planning issues. Today over 4 million people are using Trello to get things done. We’d say mission accomplished. For the purposes of this post we are going to talk about how we use Trello, but it’s important to keep in mind that Trello has virtually limitless possibilities. It’s a pretty stellar application in that way. You can shape it to whatever project you have at hand. The same way that Kanban developed from grocery stores, to car manufacturing, to software development. You can apply Trello to your grocery store list, home improvement projects and business tasks. Trello is even used by lawyers to prepare cases. CEO of Trello, Joel Spolsky compares it to his experience working on excel saying, “Trello is for anything where you want to maintain a list of lists with a group of people”. Think of the boards, workflows and cards as a canvas and decide what kind of masterpiece you want to create. This is more lists than you will find in most Trello boards. We do this on purpose because it is a more effective means of organization. More categorized lists translate into easier to follow workflows, more concrete tasks and less chance of projects going dark. What’s great about the visual boards in Trello is that they help give a snapshot for new team members. 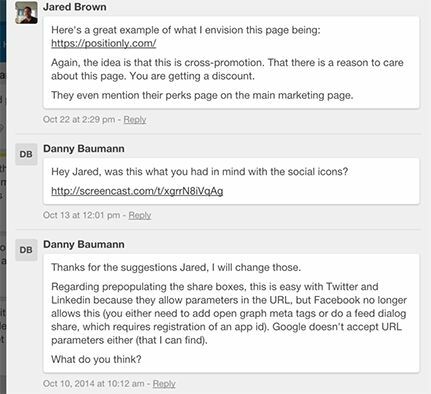 Despite what project a person is assigned to, they can see everything that is going on within Trello. Unless a board is specifically made private, anyone inside a team can see what’s happening. Everyone having access creates the added benefit of giving team members a deeper understanding of the organization as a whole. Even when they are only assigned to a specific component. Inside each board are cards. Cards correspond to specific assignments, if they don’t you’re making a mistake (but more on that later). At the top of each card is a description of the task. From there you can: add members, assign due dates, add labels, attach documents, make comments and specifically mention other individuals. We never add too many people to any one card. That’s where confusion happens. In general, the rule should be that one person is assigned to a task and the other followers on the board are those that have the biggest input in its completion. Another component of cards is checklists. Checklists allow you to organize subtasks within a card or other list relating to the card subject. 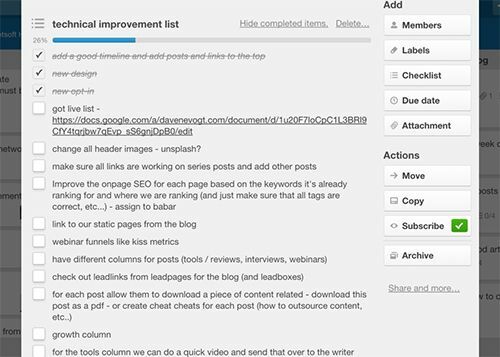 Recently, we used Trello to help us organize our blog redesign. We chose to make this its own card because it wasn’t quite broad enough to warrant its own list, but within this project were more components than in a typical card. That is where checklists come in handy. We were able to create different checklists relating to different subtasks within the umbrella task of blog improvement. In this case “blog impr ovement” included: redesign ideas, technical components and writings. A checklist was created for each of these subcategories so we could easily grasp the entire project and the individual components necessary to make it a reality. Checklists can help to ensure an important rule of thumb for project management, which is that every card includes an actionable item. Even without checklists it is important to make sure that each of your Trello cards correlates to an outcome. Keeping the organization clean, assigning cards to specific people and ensuring actionable items gives you a winning combination. Other features such as due dates, labels and attachments can be very helpful depending on the assignment but we don’t find that they are essential to the every day effectiveness of Trello. E-mail is chaotic. It might be a necessity for doing business and a quick form of communication, but it it’s not a good way to organize and plan. Even one on one email chains can get confusing. To remember an agreement that was made or an idea that was passed along you have to read a months worth of back and forth (including all the pleasantries that e-mails often start with). Long email threads containing multiple people are even worse! It’s really hard to follow along with who is talking about what. You also have to remember to read every reply and not just the last few. Heaven forbid anyone forgets to reply all! If you want to get a project accomplished email is just not a good way of doing things. When used correctly Trello acts as a replacement for those long, dreaded e-mail threads. You can even tag specific people for increased clarity. One of our favorite things about Trello is that conversations are all included within a card, so everything stays in the same place. Right where it should be. If anyone has clarifying questions about a task or thoughts to share, you don’t have to spend time looking for it or remembering. It’s all just there. Obviously, how our software integrates with other applications is important to us. With Trello, it’s pretty awesome! 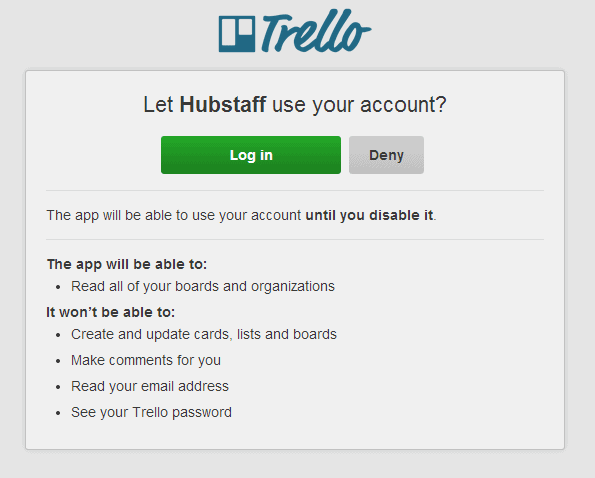 You can track time to specific Trello cards using Hubstaff. As a manager it gives you incredible insight. Maybe a project that is costing you a lot of time and money is getting hung up on a specific component. With the Trello Hubstaff integration, you’ll be able to pinpoint these issue areas, reassign projects, and identify areas for future growth. When we check in on our daily work summaries we can see which tasks were worked on and catch projects before they start going dark. I’ve worked with teams that have signed up for project management tools, started using them with zeal, only to forget they existed a few months down the road. I’ve also worked on teams that have found the learning curves with project management tools challenging. Not to point fingers, but if you are experiencing one of these reactions it’s more likely human error than the fault of the software. 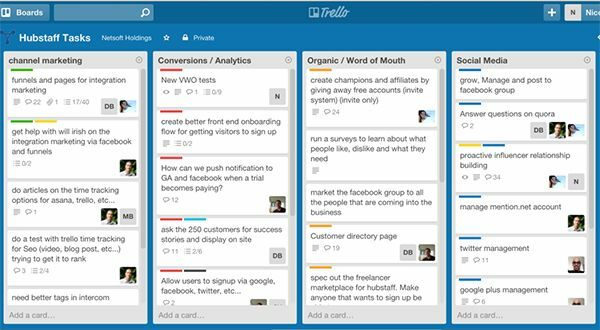 If you’re not gaining value from using Trello, it might be because you are falling victim to one of these common pitfalls. Many people choose to divide their Trello boards up by priority. I mean, that’s what Kanban boards are all about. 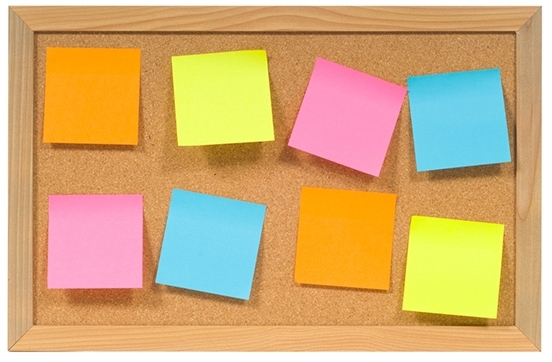 It varies by organization, but we actually recommend throwing the “Kanban” out of Trello. Organizing projects by the order of importance is not a bad thing, but we find it is not the best use of Trello. By only categorizing priority, you lose a lot of the visualization components that make Trello outstanding. Generally you will have 3 or 4 priorities levels whereas your organization might have over 10 different functional areas. It’s not a realistic understanding of what is happening in the different areas of your organization. Generally creating more streamlined workflows will result in more effective project management. We recommend organizing first my function and second by priority, using the Trello tagging functions. It’s common to lose track or get over excited when you start thinking about a project. When this happens, you can end up squeezing way too many things into one card. This is a recipe for disaster. Having everything in one place makes things easier and more accountable. If you stick 100 things and 12 people in one Trello card, inevitably things will wind up getting disoriented and you will lose track of what the goal is. Trello is not a storage unit, it is a project management solution. Do not use Trello to record all the things you want to get done or to make daily to-do lists for yourself. If you treat Trello the same way you do a pen and paper or post-it note it will give you the same value. Many an intelligent individual has fallen victim to the storage unit syndrome. Don’t be one of them. 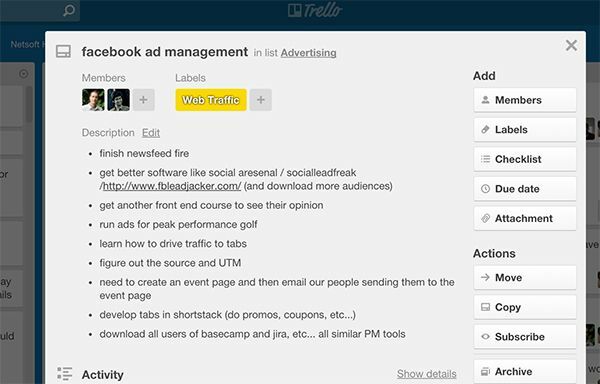 If you want to maximize your value with Trello, make sure that you are using it to see real time workflows, unite efforts, connect team members and of course get things done. If you are on a team that is living without project management software, it’s probably time you get your feet wet. Who knows where your foray into project management software will take you, but we think Trello is a great place to start. Like Joel Spolsky says, “Trello is about maintaining lists” and everyone gets lists.